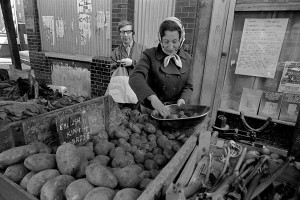 Watney Street Market in Shadwell, was once a thriving street market. In the 1920′s there were more than a hundred stalls and many shops. But by the 1970′s, there was little left, a few of the old stallholders clung on, as the streets were demolished, their customers slowly moving away. In 1977 the last of the old market was finally demolished, and the few remaining businesses moved to a new shopping precinct off the Commercial Road.